If there is ever an event focused on food, count me in. I love events that bring people food lovers together. 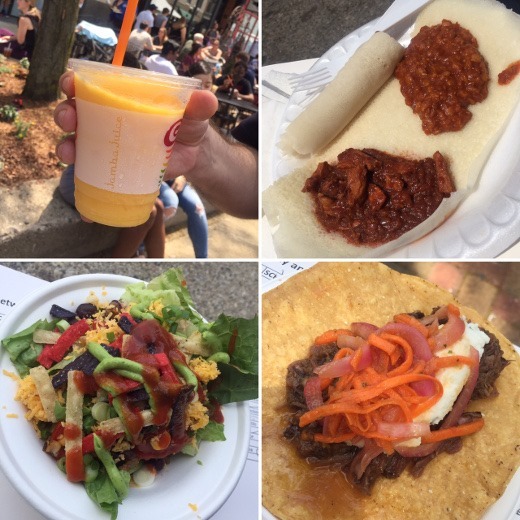 Taste of Ann Arbor annually showcases the many wonderful restaurants we are so lucky to have here in town. I think one of the coolest thing about this event is the opportunity to try small dishes from so many different restaurants. It’s also a fun way to sample a restaurant’s fare without the commitment of dining in for a full meal. Participation in the event provides great exposure opportunities for local eateries and great fun for local food lovers. 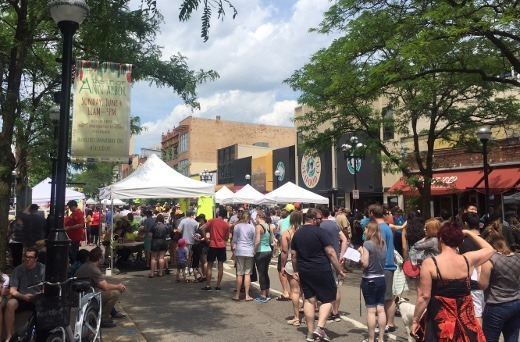 This year, the event, which is hosted by the Main Street Area Association, brought thousands to downtown Ann Arbor. This meant that later in the day the lines got a bit long! It was also very hot this year! My advice if you attend one of these events in the future is to (1) get there early, (2) stay hydrated, and (3) get a map, and (4) hit up your must-try spots first! 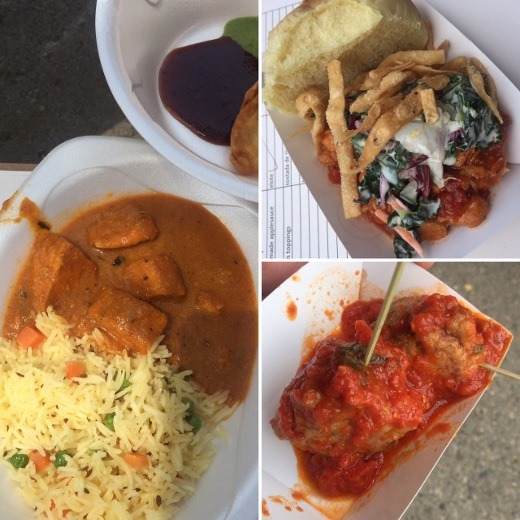 What judging means is that I need to try food from all 38 stands! Which is kind of crazy actually. By the end it takes a lot of willpower – your stomach gets SO full! And after tasting everything, I provide feedback on my top few choices in each of several categories, along with a handful of other judges as well, and then the votes are compiled. 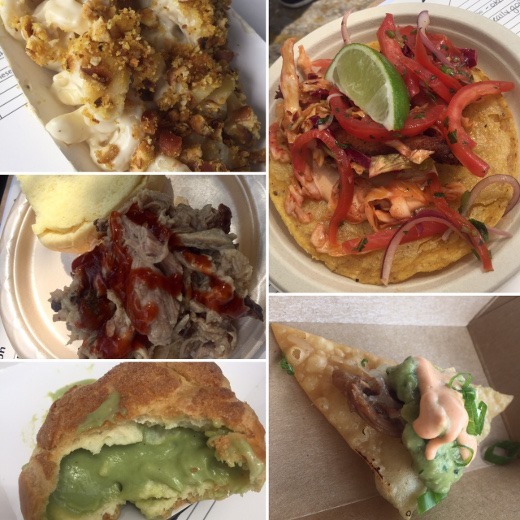 I wanted to share with you several of the foods I sampled and give a shout out to some of my favorites! 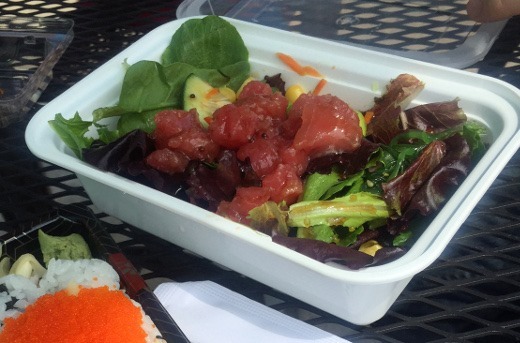 My very favorite thing that I tasted the whole day was this amazing Tuna Poke Salad from Godaiko! It was so fresh and perfect for a hot day! Featuring a slightly sweet sesame ginger dressing, tender baby greens, edamame, bursts of sweet fresh corn, and delicious bites of diced raw tuna, this salad was swoon-worthy! I hope they add it to their regular menu. This was one dish I could not stop eating even though I needed to save room for lots more food to come. TOARMINA’S – Pizza – super long slices! 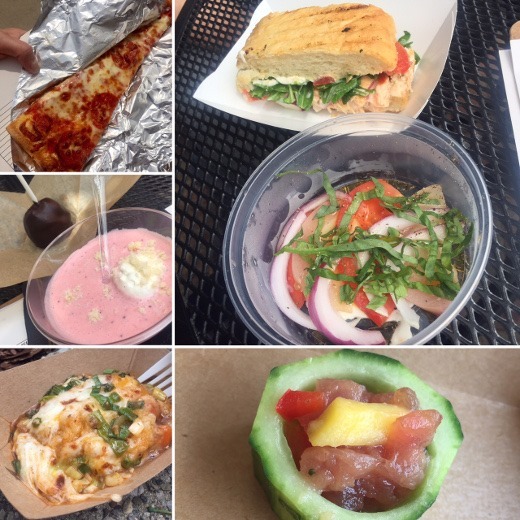 GRATZI: Smoked Salmon Panini and Peach Caprese Salad – both were fantastic! CONOR O’NEILLS: Shepherd’s Pie – so cheesy! GRATZI – Meatballs – yum! SLURPING TURTLE: Green Tea Puff – yummy! BLACK PEARL – Fish Tacos – never fail to AMAZE! 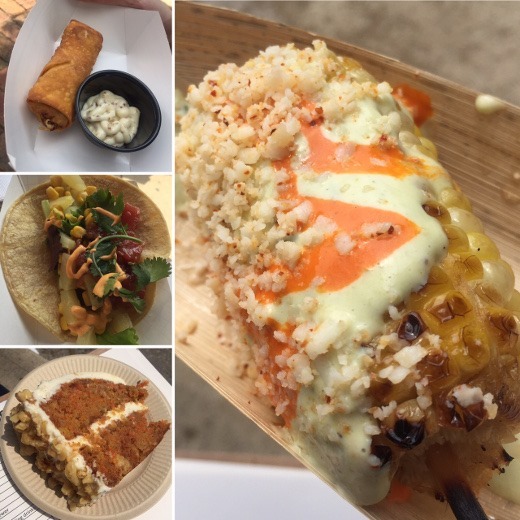 VINOLOGY: Elotes (Mexican Street Corn) – won BEST VEGETARIAN – yum!! NAGOMI DOWNTOWN Poke Tuna Taco – great idea but not executed well – raw corn tortilla need to be cooked and broke in half, and big chunks of cilantro stem were unappealing – sorry! THE EARLE – Carrot Cake – fantastically moist! It would be remiss of me not to mention that my “plus one” for judging was the huz! He helped me taste and judge all the dishes. We have quite similar tastes in food and both absolutely love trying new dishes. Also I tasted even more dishes beyond what is featured here, but didn’t get a chance to snap shots of every.single.thing. These are most of the more photogenic dishes. JAMBA JUICE: I should also mention how much we adored this mango smoothie – it was our palate cleanser between so many dishes and extremely tasty. BLUE NILE: Spicy Chicken and Red Lentils – won BEST ENTRÉE and I loved it! I really want to go eat dinner there again soon! It’s been way too long. VEDGE CAFÉ – Taco Salad – I appreciate that this was vegan and maybe I just don’t have a taste for dairy-free “cheez” yet but I didn’t really care for this salad too much. Their vegan desserts were very delicious and won BEST DESSERT (for gluten-free peanut butter cookie) though! AVALON – Oxtail Tostada – sadly not a winner for me, was a little bummed since this was my first taste of Avalon. I think I will give them another chance and trying dining in soon, though. From the Best In Show Winner – Cantina Taqueria – we got to tried a chorizo and carnitas tacos, which were good (especially the carnitas), and even better were these paletas (Mexican Ice Pops). 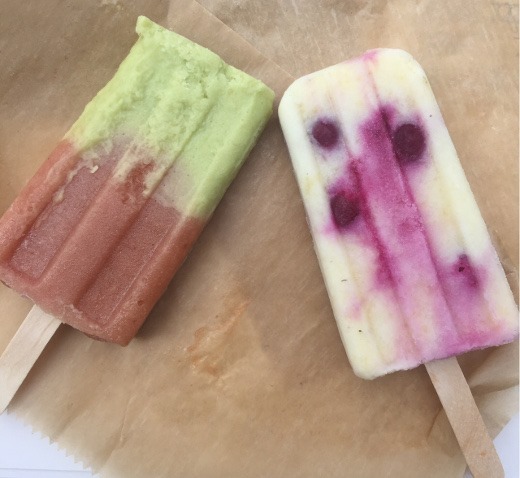 The left one below was avocado and rhubarb – and OH MY GOODNESS you guys! It was just beyond words. Freaking De.Lish.Us. So there you have it guys! 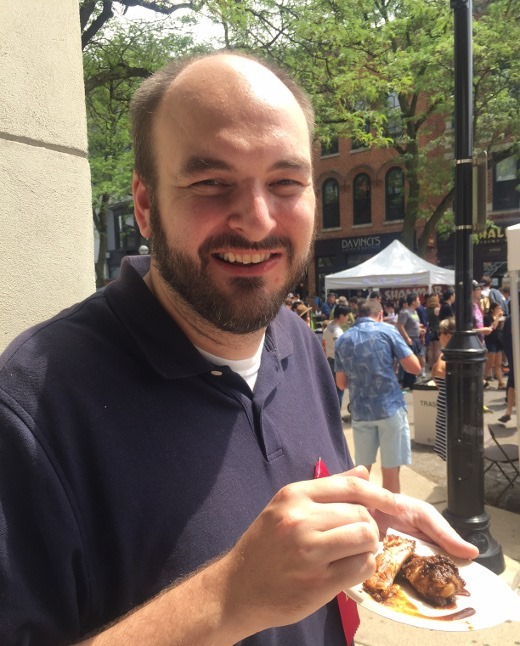 Ann Arbor is such a wonderful food town and I feel so lucky to have been able to serve as judge at TOAA again this year. Big thanks to Ann Arbor Main Street Area Association for asking me, and for hosting this great community event! While I do feel this is certainly a family-friendly event, we opted to get childcare for our toddler this year, since we had to make our rounds at every single booth and weren’t sure our 1 year old would tolerate that. This made for a fun “day date” for the huz and I too! Hope to see you all out there next June!